Gonna go see the Addams Family tonight. So I figured I'd use this magnet of the Adams family library to celebrate. Adams National Historical Park in Quincy, MA, is cool in its own right. The National Parks Service site includes the birthplaces of both John Adams (our 2nd president) and his son John Quincy Adams (our 6th president) - so much history born within a stone's throw of each other. 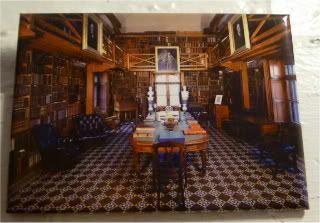 But on top of that, you can also visit the Stone Library, which was built in the 1870s to house all the important papers and books of the Adams family. I blogged a bit about this place before, actually, but didn't use this library magnet. During the quick tour we did in there, the space quickly became my favorite place ever. The medieval architecture was a departure from the colonial look and feel of the rest of the property, creating a whole world far removed from its surroundings. Goodness, what I wouldn't given to have some time and free reign to take a look-see through the more than 14,000 books, across a dozen languages and even more subjects lining those shelves, upstairs and downstairs. It's always fascinating to see what ends up in private libraries - the books people collect say so much about them and who they are. Once, in college, an elderly couple had donated their entire library to our undergraduate collection, so one fabulous weekend, we ended up trekking out to their house take inventory. 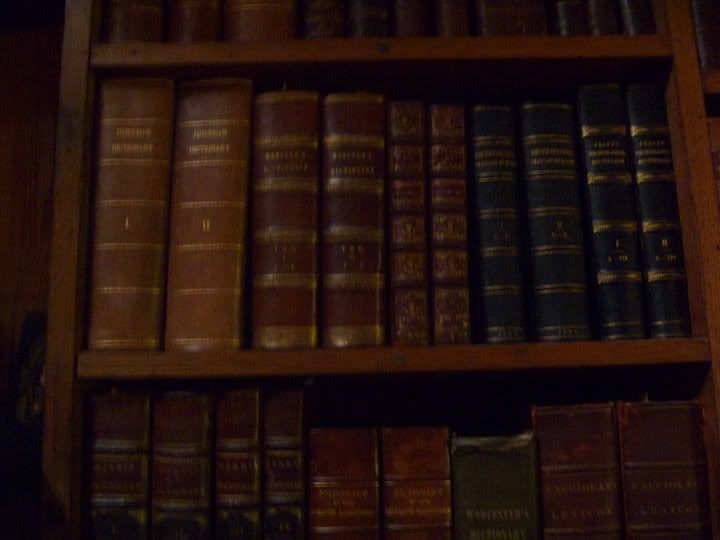 It was amazing the books we were finding on their shelves - every subject, very old binding, books of poetry and literature. My favorites, though, were the very old, very loved, red Baedekers travel guides from the early 1900s, most of them having been lovingly inscribed by the couple to each other. Amazing. That's why instead of listening whole-heartedly to the park ranger at the Stone Library, I edged my way to the back of the group so I could check out what the Adams family had in their collection. And right at eye level, and oh! so close! was Webster's dictionary. No. Seriously. When I first started in publishing, we were all referring to Web10, Merriam-Webster's 10th edition. The Adams family? Owned the first and second editions. Whoa. When I realized what I was looking at, I totally hid myself from park ranger view, so I could sneak a quick picture of them. You'll see I succeeded in taking quite the blurry picture below...taken just in time for me to hear the ranger let us know how they finally had to install a state-of-the-art security camera system because of a break-in and theft.